Singapore’s penchant for absorbing the best dining trends from around the world has meant the tiny island-state now boasts a delightful mash-up of franchised or flagship eateries that you would otherwise have to schlep halfway around the world for. Case in point is the newly minted Clinton St. Baking Company, a juiced-up outpost of Neil Kleinberg and Dede Lahman’s legendary Lower East Side boîte and the third outside of New York joining Tokyo and Dubai. 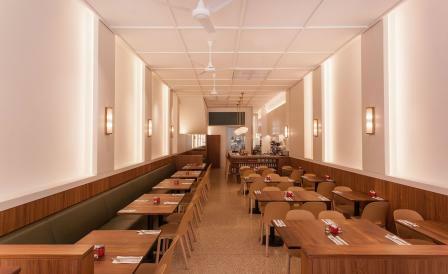 The interiors, supervised by the Bangkok-based designer Albano Daminato, bear echoes of the original, though the space, carved out of a fin-de-siecle shophouse, is considerably less claustrophobic, while white subway tiles, terrazzo floors, pendant lamps and wooden Alfi chairs lend the space an airier vibe. Wisely, head chef Garry Edgley rarely strays from the original favourites of buttermilk fried chicken and waffles, pancakes with warm maple butter, chocolate peanut butter milkshakes, and grenade-sized scones make with aged and orange cheddar. The deep South accents are not subtle – buttermilk biscuit sandwiches, fried green tomatoes, peanut butter ice box pies, po’ boys, and cheese grits being the least of them – but they certainly help explain the queues.